Jupiter is putting on quite a show — with both sound and light. A new Hubble image shows a stunning light show, capturing an aurora display on the largest planet in our solar system (see above). 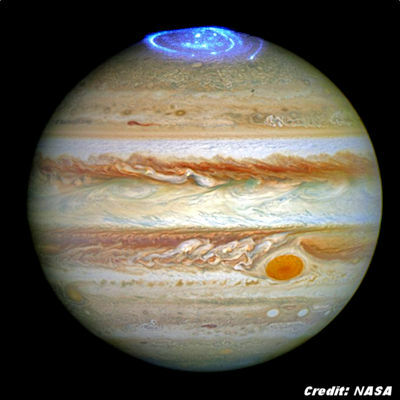 Jupiter’s auroras cover areas bigger than the entire Earth, are hundreds of times more energetic and never cease, the European Space Agency said in a news release. Unlike auroras here, which are caused by solar storms, Jupiter pulls charged particles from its surroundings, including solar winds and even the volcanos on Io, one of its moons and the most volcanically active world in the solar system. In addition to stunning images, NASA also released unusual “sounds” from Jupiter captured by the Juno spacecraft, which will enter orbit around the planet on July 4.